Did you know that many reptiles, marine mammals, and birds sleep with one side of their brains awake? This adaptation lets these creatures rest and conserve energy while remaining alert and instantly ready to respond to threats and opportunities. It also enables amazing behaviors such as allowing migrating birds to sleep while in flight. How’s that for maximizing productivity? Taking a cue from nature, many new desktop PCs challenge how we define sleep with Intel® Ready Mode Technology. This innovation replaces traditional sleep mode with a low-power, active state that allows PCs to stay connected, up-to-date, and instantly available when not in use—offering businesses several advantages over existing client devices. Users get the productivity boost of having real-time information ready the instant that they are. Intel Ready Mode enhances third-party applications with the ability to constantly download or access the most current content, such as the latest email messages or media updates. It also allows some applications to operate behind the scenes while the PC is in a low-power state. This makes some interesting new timesaving capabilities possible—like, for example, facial recognition software that can authenticate and log in a user instantly upon their arrival. In addition, when used with third-party apps like Dropbox*, Ready Mode can turn a desktop into a user’s personal cloud that both stores the latest files and media from all of their mobile devices and makes it available remotely as well as at their desks. Meanwhile, IT can easily run virus scans, update software, and perform other tasks on user desktops anytime during off hours, eliminating the need to interrupt users’ workdays with IT admin tasks. PCs in Ready Mode consume only about 10 watts or less (compared to 30 – 60 watts active) while remaining connected, current, and ready to go. That’s enough energy to power an LED lamp equal to 60 watts of luminosity. Energy savings will vary, of course; but imagine how quickly a six-fold energy-consumption reduction would add up with, say, 1,000 users who actively use their PCs only a few hours a day. In the conference room, a desktop-powered display setup with Intel Ready Mode will wait patiently in an energy-sipping, low-power state when not in use, but will be instantly ready to go for meetings with the latest presentations and documents already downloaded. How much time would you estimate is wasted at the start of a typical meeting simply getting set up? Ten minutes? Multiply that by six attendees, and you have an hour of wasted productivity. Factor in all of your organization’s meetings, and it’s easy to see how Ready Mode can make a serious contribution to the bottom line. 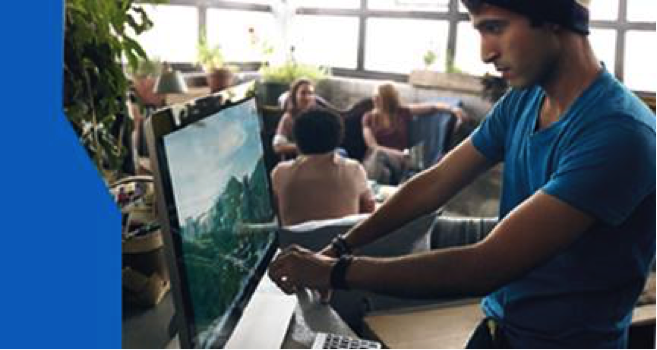 Desktops with Intel Ready Mode help make it easier for businesses to move their landline or VoIP phone systems onto their desktop LAN infrastructures and upgrade from regular office phones to PC-based communication solutions such as Microsoft Lync*. Not only does this give IT fewer network infrastructures to support, but with Ready Mode, businesses can also deploy these solutions and be confident that calls, instant messages, and videoconference requests will go through even if a user’s desktop is idle. With traditional sleep mode, an idle PC is often an offline PC. Next article:Could Your Old PCs be Putting Your Business at Risk?